In January, Manhattan had a single sale that was large enough to skew the average price of the entire borough–Ken Griffin’s record-setting $238 million purchase at 220 Central Park South. 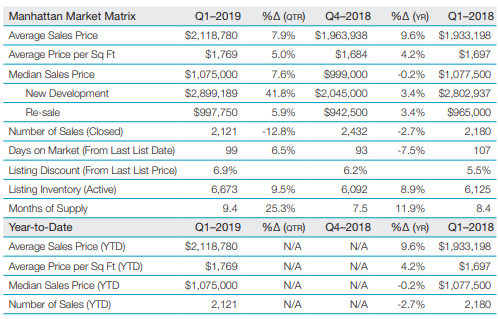 Other indicators showed an ongoing slowdown of the market in Q1, yet resales remain strong with the median sales price rising to a record high. Median sales price broke the $1 million mark again after dropping to $999K last quarter. Days on the market dropped from 107 to 99. Listing inventory rose almost 9% from last year, boosting the absorption rate from 8.4 months to 9.4 months. The number of closed sales was 16.4% below the 20-year average. Listing discounts increased from 5.5% to 6.9%. Median sales price set a new record, up 5.9% from last quarter.